NCERT Textbook Solutions are considered extremely helpful when preparing for your CBSE Class 9 Mathematics exams. TopperLearning study resources infuse profound knowledge, and our Textbook Solutions compiled by our subject experts are no different. Here you will find all the answers to the NCERT textbook questions of Chapter 7 - Triangles. All our solutions for Chapter 7 - Triangles are prepared considering the latest CBSE syllabus, and they are amended from time to time. Our free NCERT Textbook Solutions for CBSE Class 9 Mathematics will strengthen your fundamentals in this chapter and can help you to score more marks in the examination. Refer to our Textbook Solutions any time, while doing your homework or while preparing for the exam. AB = AB (common) So, BC and BD are of equal length. Since alternate angles are equal. From equations (2) and (5), we can say that AP is perpendicular bisector of BC. BE = CF (given) (Sides opposite to equal angles of a triangle are equal) Hence, ABC is isosceles. Let us consider a right angled triangle ABC, right angle at B. So, AC is the largest side in ABC. But AC is the hypotenuse of ABC. Therefore, hypotenuse is the longest side in a right angled triangle. 180 - PBC > 180o - QCB. Let us take a line l and from point P (i.e. not on line l) we have drawn two line segments PN and PM. Let PN be perpendicular to line l and PM is drawn at some other angle. Circumcentre of a triangle is always equidistant from all the vertices of that triangle. Circumcentre is the point where perpendicular bisectors, of all the sides of triangles meet together. As here in ABC we can find the circumcentre by drawing the perpendicular bisectors of sides AB, BC, and CA of this triangle. O is the point where these bisectors are meeting together. So O is point which is equidistant from all the vertices of ABC. 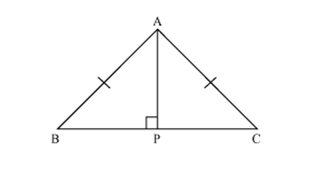 The point which is equidistant from all the sides of a triangle is incenter of triangle. Incentre of triangle is the intersection point of angle bisectors of interior angles of that triangle. Here in ABC we can find the incentre of this triangle by drawing the angle bisectors of interior angles of this triangle. I is the point where these angle bisectors are intersecting each other. So, I is the point, equidistant from all the sides of ABC. Ice-cream parlour should be set up at the circumcentre O of ABC. In this situation maximum number of persons can approach to it. We can find circumcentre O of this triangle by drawing perpendicular bisectors of the sides of this triangle. TopperLearning provides step-by-step solutions for each question in each chapter in the NCERT textbook. Access Chapter 7 - Triangles here for free.